A reminder that the Active Retirement Christmas Lunch club will take place on Friday 8th December in The Roundwood Inn at 1.30pm. There will be a pilgrimage to Lourdes from Roundwood in September, 2018. Names and €200 deposit before 15thJanuary, 2018 to Susan at 087 6273032. A pilgrimage to Knock will be on Divine Mercy Sunday 8thApril, 2018. More on both pilgrimages at a later date. All roads lead to Aras An Tochar this Sunday for the Roundwood & Moneystown Sale of work from 12 noon to 4pm. There’s something for everyone, Beautiful Festive flower arrangements, Wheel of Fortune, Bottle Stall, Home Produce, Toy Stall, Books, Face Painting, Birc a Brac, Roulette, Carol Singing, win you Turkey, Ham and Christmas Cake. Walk away with €1,000 or any of the many prizes on the grand Raffle. Santa will also be there to meet all the local boys and girls… A great day out for all the family, so do come along. Results Monday 13th November North/South 1st Nancy O Brien and Brid Clancy, 2nd Margaret and Pamela Byrne, 3rd Catherine McGillycuddy and Gertie Fee. East/West 1st Molly Byrne and Rachel Judd, 2nd Ger Lenihan and Paddy O Brien and 3rd Rowena Brady and Judy Skates. Declan O Brien and Triona Woodroofe took 1st place for North/South on Monday 20th November, 2nd Bridie Nolan and Phil Power, and 3rd Seamus Kennedy and Pauric Gleeson. East/West victors were Judy Skates and Rowena Brady, 2nd Maura Gaskin and Pamela Byrne and 3rd Mary Brown and Miriam Coyle. Friday 17th November saw Maria Magee and Rowena Brady take 1st place for North/South, joint 2nd/3rd were Rachel Judd, Molly Byrne, June Digby and Gaye McGettigan. 1st for East/West were Noeleen Redmond and Margaret Bolger, 2nd Ger Lenihan and Paddy O Brien, joint 3rd/4th were Jane Cronin, Gertie Fee, Maura Gaskin and Bridie Nolan. Phil Kenna and Liz Belton took 1st place for North/South on Friday 24th November, joint 2nd/3rd Monica Brady, June Digby, Nancy O Brien and Catherine McGillycuddy. John Loscher and Rowena Brady were 1st East/West, 2nd Marian Davies and Teresa Leahy and 3rd Gertie Fee and Jane Cronin. Roundwood Community Games AGM will take place Monday 4th Dec in Kavanagh’s Lounge @ 9 pm. All are welcome to attend. Community games covers a wide range of events, with limited man power we only touch on a few. If you have a particular area of interest & would like to give some time please come along to the meeting. Our annual fundraising bag pack is scheduled for Friday 15th & Saturday 16th of December in Dunnes Stores, Newtown. We need full support from all parents to make this successful weekend. Please let us know if you are available to help on either day. Seamus Doyle 086 8557962, Brenda Fox 086 8521507. There will be a Set dancing Christmas party night on December 1st 9pm till late at Mill Room Kilcoole. Music by Pat Bass & Co. All welcome. The monthly dance in Roundwood Parish Centre will take place on Friday 15th December 9pm – midnight. with music by The Wicklow man. Refreshments served. The Wicklow Man will play in Moneystown community centre on Friday 8 December from 9.30 pm till 12. teas served, refreshments also available, door prizes. Come along and enjoy a night of waltzing, jive, line-dancing, etc. The results of the whist is as follows:- Top Score: Shay Brady; Top Gent: Mick Whelan; Second Gent: Pat Fisher; Top Lady: Monica Brady; Second Lady: Patricia Byrne; First Half: May Kenna; Second Half: Maura McHugh & Catherine Doyle (shared); Longest Sitting: Jimmy Molloy & Lowest Score: Magdaline Kennedy. Raffle prizes were won by Mick Whelan, Magdaline Kennedy, Margaret Kennedy & Monica Brady. Next whist will be on Wednesday 6th December in the Parish Centre. This entry was posted in News & Events on November 27, 2017 by roundwoodiewicklow. At Mill Room Kilcoole. Set dancing Christmas party night on December 1st 9pm till late. Music by Pat Bass & Co. All welcome. A cabaret in aid of the Senior Citizens Christmas party will take place in The Royal Hotel, Glendalough on Saturday 25th November, music by “Little Apples~”. All are welcome. There will be a pilgrimage to Lourdes from Roundwood in September, 2018. Names and €200 deposit before 15th January, 2018 to Susan at 087 6273032. A pilgrimage to Knock will be on Divine Mercy Sunday 8thApril, 2018. More on both pilgrimages at a later date. An Tochar GAA will hold their AGM November 26th 2017 at 6pm in Aras an Tochar. The Garda Band will again play a concert in aid of the St. Vincent de Paul in Roundwood Church on Tuesday 28th of November. Tickets €10. Further details closer to the date Tickets Available from: Parish Office, Roundwood Post Office, Kavanagh’s Butchers, Keeley Hardware and Ashford Post Office. 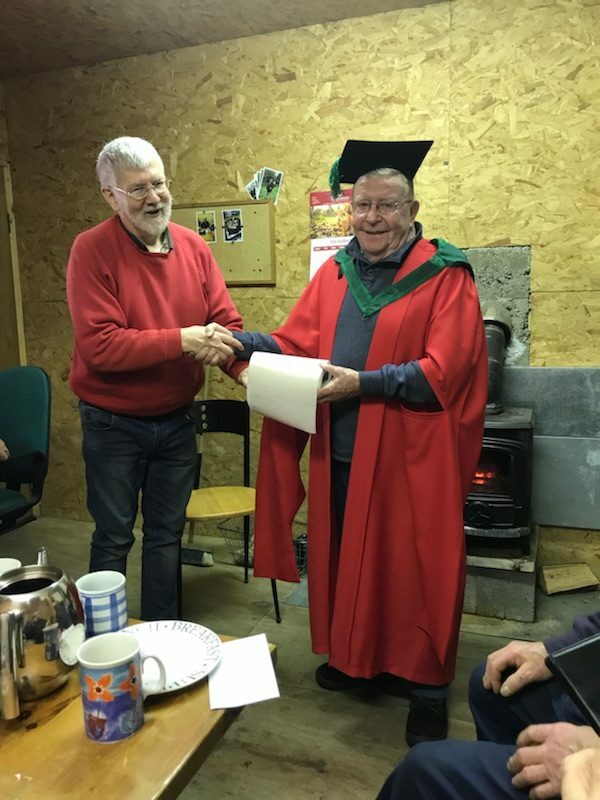 Roundwood and District Men’s Shed: Our trip to Leinster House is scheduled for Tuesday 5th December and we will be departing by minibus from the Parish Hall in Roundwood at about 10 a.m. Please have a word with any of the shedders or feel free to call 086 8650588 if you would like to come along for the occasion. Lunch in the Visitors Bar and Leaders Questions as well as a Tour of the House are all on the agenda. 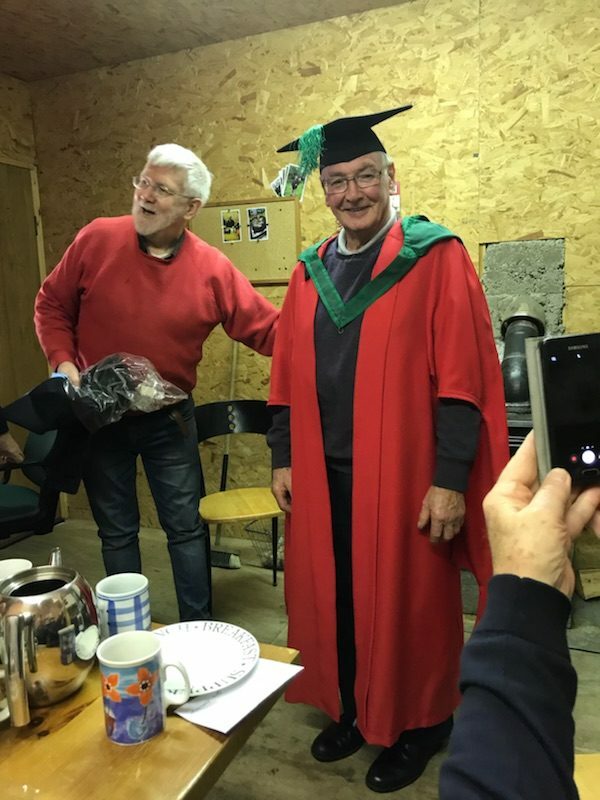 Recently in the SHED Dr. Máirtín conferred honorary degrees on some deserving members. They had the gowns and the headgear and hopefully you will be able to see the photographic evidence on the world wide web in the near future. Call 086 8650588 anytime or have a word with one of the shed members if you are interested in joining. The next whist will be on tonight Wednesday the 22nd November in the Parish Centre. This entry was posted in News & Events on November 20, 2017 by roundwoodiewicklow. Members of the Men’s Shed are heading to Leinster House on Tuesday 5th December. The are travelling by minibus from the Parish Hall in Roundwood at about 10 a.m. 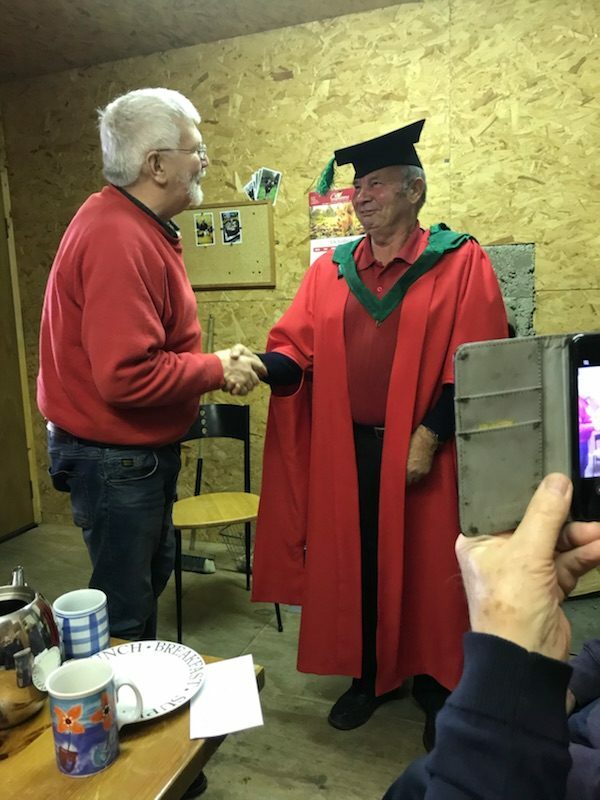 If you are interested in going there are still a few places available so do contact any of the shedders or feel free to call 086 8650588 if you would like to come along for the occasion. There will be lunch in the Visitors Bar, a chance to see Leaders Questions as well as a Tour of the House.